In association with medical advances that have prolonged survival in both critically and chronically ill patients, including the introduction of a number of effective antimicrobial agents, a change in the pattern of many infections has occurred from acquisition outside of the hospital to acquisition within the hospital . Bacterial infections of the respiratory tract have been reported to occur in 0.5 to 5.0% of hospitalized patients . In a study of nosocomial infections in six community hospitals Eickhoff and associates  observed an adjusted rate of 3.5% for all types of nosocomial infections. Of these infections, 15.4% involved the respiratory tract and 53% of the pneumonias were associated with aerobic Gram-negative bacilli . Bacteria may invade the alveolar level of the lung in sufficient numbers to produce infection by three routes: (1) haematogenously from a distant focus causing bacteremia such as Escherichia coli pneumonia during pyelonephritis ; (2) by suspension in inhaled gas which is a well recognized potential danger in the case of respiratory therapy, and (3) by aspiration from the pharynx, the most frequent route of lung infection. Indirect evidence supports this assumption [5, 6, 7], and the aspiration into the lung of radiopaque material instilled into the oropharynx of normal sleeping adults has been demonstrated . 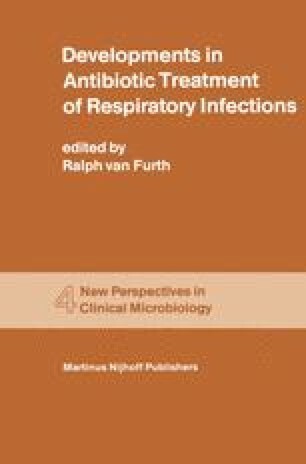 Perhaps the most compelling evidence for the pharynx as a major source of infection of the bronchial tree is that from Johanson and coworkers, who studied the relationship of oropharynx colonization with Gram-negative bacilli to nosocomial pneumonia in patients admitted to a medical intensive care unit .